This year I sadly didn't get to experience any music festivals but that doesn't stop be enjoying all the things that come with it. 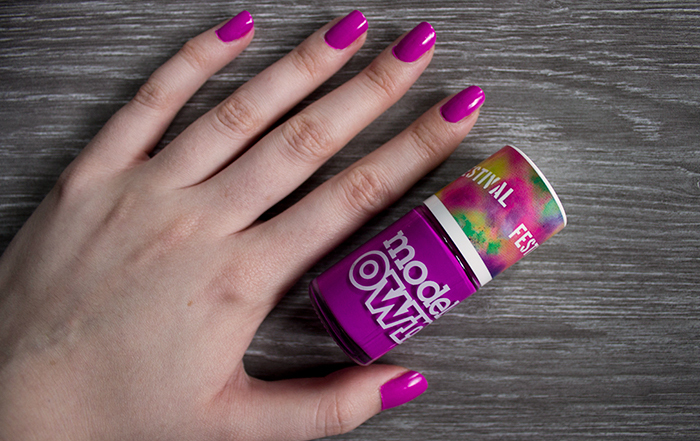 More and more brands came out with festival related products this year and one I've been loving is the Models Own Festival Nail Polish in Purple Bandana. Purple Bandana is an almost neon fuchsia shade with a semi-matte finish. Personally I feel it's more on the pinky side than purple when it sets but that's just my opinion. Application wise, the shade applies really well on the nails. Slightly thicker than your average Models Own shade, most likely due to the finish but the formula glides over the nails evenly without any fuss. Although the shade is fairly opaque on one coat, I'd recommend two to get the full effect of the colour. Normally shades with a sort of matte finish tend not to last too long on my nails but I was really impressed by the longevity of this polish. I had no chipping whatsoever and the only reason I had to remove it was due to my nails growing out. It will definitely last you through a week of festival celebrations. All in all, I love the shade. Everything from the colour to the longevity is perfect and if you're looking for something fun and bright, it's the perfect shade to go for.